Burnley sealed a return to the Premier League at the first time of asking as Sam Vokes’ header saw off QPR at Turf Moor. The Clarets knew ahead of kick-off that a win would secure automatic promotion, after rivals Middlesbrough were held at Birmingham on Friday night, and Brighton could only draw with Derby County, thanks to an injury time leveller earlier in the afternoon. 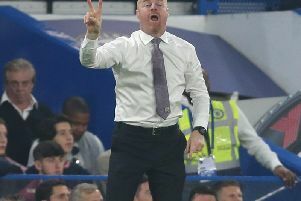 Burnley were looking to make it 22 league games unbeaten – a post-war record in a single season – against a side who joined them in being relegated from the top flight last season. Their fortunes have been vastly different in the last 12 months, with QPR changing manager in November, as Chris Ramsey was replaced, initially by caretaker boss Neil Warnock, before Jimmy Floyd Hasselbaink took the reins in December. His first home game was a goalless draw with the Clarets, when he could call upon the likes of Leroy Fer and former Claret Charlie Austin – a second half substitute. But as that pair departed in January, Burnley have not only kept the nucleus of their side together, after losing key trio Danny Ings, Kieran Trippier and Jason Shackell in the summer, they have been able to add the likes of Andre Gray, former Hoops midfielder Joey Barton and James Tarkowski. Burnley had won eight of their previous 10 home games with QPR – the only defeat in that sequence coming in 2007 when Gabor Kiraly went walkabout late on. And QPR had failed to win in their last eight away games in the Championship, although six of those games ended in draws. Burnley made one change, with Dean Marney missing out with the hamstring problem he suffered late in the win at Preston. David Jones returned to the side, alongside Barton in the centre of midfield. The opening stages were stop-start, not helped by an awful challenge from Rs forward Sebastian Polter, who caught Barton from behind with a two-footed challenge, both feet off the ground. It was a red card offence, but not in Jon Moss’ eyes, who only booked the German. Sam Vokes also required treatment for a bang to the head, though he, like Barton, was okay to resume. The first shot of note took 16 minutes, as Polter headed down for Matt Phillips, and his volley skidded off the pitch, with Tom Heaton palming the ball away to his left, where Stephen Ward prevented Michael Petrasso profiting. Polter was involved again, handling as he challenged Scott Arfield, and was given a last warning by Moss. Vokes had the sting taken out of a goalbound volley by Clint Hill, while Heaton fielded a low drive from Cole Kpekawa at the other end. Just after the half-hour, Junior Hoilett stung the palms of Heaton, who claimed his 20-yard strike at the second attempt, and Phillips tried his luck with a left-foot effort from a similar distance, well held by Heaton. Burnley struggled for any fluency in their play, and QPR continued to look the more likely, with Heaton forced to come out bravely to deny Petrasso from Kpekawa’s ball over the top. Burnley won their first corner with four minutes to go before the break, prompting a roar from the home fans, desperate to see a breakthrough, but David Jones’ flag kick was disappointingly cleared at the near post. Kpekawa clattered Arfield just before the break – another poor Hoops challenge – and was booked, and QPR ended the half on the front foot, giving Sean Dyche much to ponder at half-time. Burnley came out with renewed purpose, and were agonisingly close to take off when Arfield measured a lob just over following a goalmouth scramble. QPR continued to be awkward opponents, however – they could not be accused by Brighton or Boro of having their flip-flops on already. Andre Gray was kept quiet in the first half, but outmuscled Nedum Onuoha to get on the end of a ball from Ward, but with Vokes screaming for the ball in the centre, the Championship player of the year sliced his effort harmlessly across goal. Polter had a shot deflected wide of the near post, while the veteran Clint Hill forced a save from Alejandro Faurlin’s corner. A minute later, Gray won a free kick out on the right, and Jones’ inswinging delivery was perfect for Vokes, who guided a header into the far corner for his 15th goal of the season. Hasselbaink responded by bringing on striker Conor Washington on for former Blackburn winger Junior Hoilett, as the noise levels cranked up within Turf Moor, the anxiety lifted. QPR were denied a leveller midway through the second half when Faurlin’s screamer looked in all the way, but hit the outside of the post with Heaton beaten. Abdenasser El Khayati came on for Petrasso, and Ben Gladwin for Polter as QPR looked to rescue a point, and Ashley Barnes replaced Gray – two years after scoring to help seal promotion against Wigan. Matt Ingram made a remarkable save with his feet to deny Arfield a second, and Vokes headed in Jones corner, only for Ward to be penalised for a push on the keeper. But one goal proved enough as a 19th clean sheet saw Burnley back in the big time.